Patricia Perez Eustaquio <pron. yoo-stak-yoh> b. 1977, lives and works in Manila. Eustaquio is an artist who works with shadows, fragments, discards and detritus, taking on such marginalized themes in a language that is at once evocative and familiar. She works in a variety of media, exploring materials through painting, drawing and installation. She fashions sculpture from fabric, shrouding objects with crochet or silk treated with resin and then removes the object allowing the fabric to retain the folds and drapes. The resulting ghost (-piano, -chair, -birdcage) examine ideas of memory and perception. Her similar approach to painting translates the rigid pictorial square to a fragmented object, where its bounding frame is removed or cut away, resulting into ornately shaped canvases haunted by imagery of discards and detritus, wilted blooms and carcasses. Eustaquio’s work recalls the domestic as well as perhaps the psychic lives of objects by the repeated rehashing of memory where the familiar or the banal takes on a new substance, where the material and the immaterial coexist. She has been the recipient of awards for emerging artists, and of artists’ residency grants such as Art Omi in New York. She has had solo shows in Manila, Taiwan, Singapore, and New York, and has been part of several, notable group exhibitions including shows at the Hong Kong Art Centre (HKAC) and the Singapore Art Museum. Her work recently featured in The Vexed Contemporary at the Museum of Contemporary Art & Design in Manila. 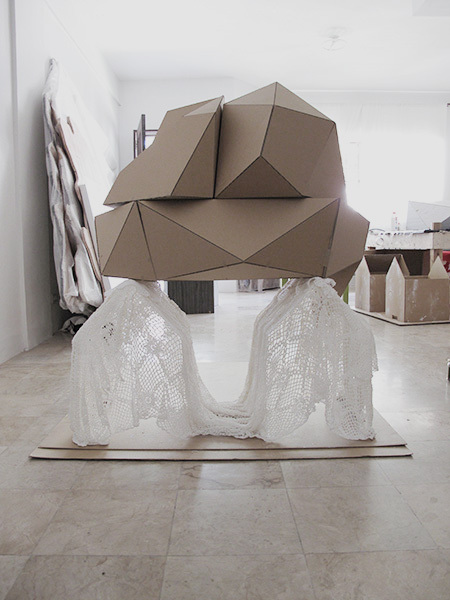 For 2016, she has been commissioned to work on a site-specific installation at the Palais de Tokyo in Paris. The exhibit will run from 23 June to 22 September. This multifaceted talent, which is quite rare among contemporary artists in the Philippines so absorbed either in skill or worn-out conceptual masquerades, leads her to calibrate a language that articulates insights into both craft and embodiment, the process of making and the performance of taking on habits. This disposition could be discerned early on when for her thesis in the university, she made canvas shoes, wore them, walked around the city leisurely and aimlessly, and presented the peripatetic inscriptions on the soles, imprints of which she also painted. Craft here pertains to fabric, leather, ceramic, crochet, and upholstery, within the range of the homespun and the industrial. And embodiment gestures toward fashion, a film noir narrative of a violence or crime, and poetry written in neon. Here the sensibility is nostalgic, looking back at fragments of memory, totems, reminders of her kin, specifically her grandmother whose annotation in one of her photographs the artist would quote and include in the painting of the memento: “They stood right in front of my only blooming shrub & hid the flowers.” This nostalgia runs through cast of shoes, embroidery on a found ironing board, recipes and chocolate cake served on opening night, painting that captures moment of demise like a dead pheasant or a pig slaughtered and the blood blooms and permeates the canvas. why the trope of the still life and the interior is salient: it portrays the production of property, its worldliness, on the one hand, and the ephemeral nature of things, on the other. The inclusion of game, or hunted animals, in painting and drapery in domestic fixtures speaks of this possibility of vanishing. Having said that, the tableau is also exceptionally “contemporary” and “present” because it indexes quotidian economy, its “pop” culture in a manner of speaking, and the objects leap out of the frame to engage the otherwise passive consumer of commodities. Eustaquio romances an artisanal effect in many of her projects, finding affection in marginalized forms or the so-called minor arts that privilege decoration as an aesthetic culmination. She explores the nuances of this mentality in Death to the Major Viva Minor (2008), inspired by Bach’s canonical The Well-Tempered Clavier, a template for harmonies in western tonal music. This resonates with the ceramic work Arteria Axilliaris (2008), a dissected arm in the mode of an anatomical study that is also a violin, still well within an examination of the fetish for the folly of perfect measure: body, music, art. Eustaquio’s predilection as a designer of clothes is important in understanding her calling because it crosses the gaps between a feminine everyday life and an ethical zone in the art world that takes issue with the virtues of rationality, conceptualism, and indifference to hand-made, time-consuming, labor-intensive things. It also nudges her closer to the source of fabric’s wonder: motif, pattern, repetition, and the meditative quality of painting through the grid and the thin brush. Her current interest in ceramics should take her to more uncharted trails in this intersection between the daily and the deliberate, as she paints, installs, designs for film, theater, dance – and dresses up intrepid fashionistas and daring brides.